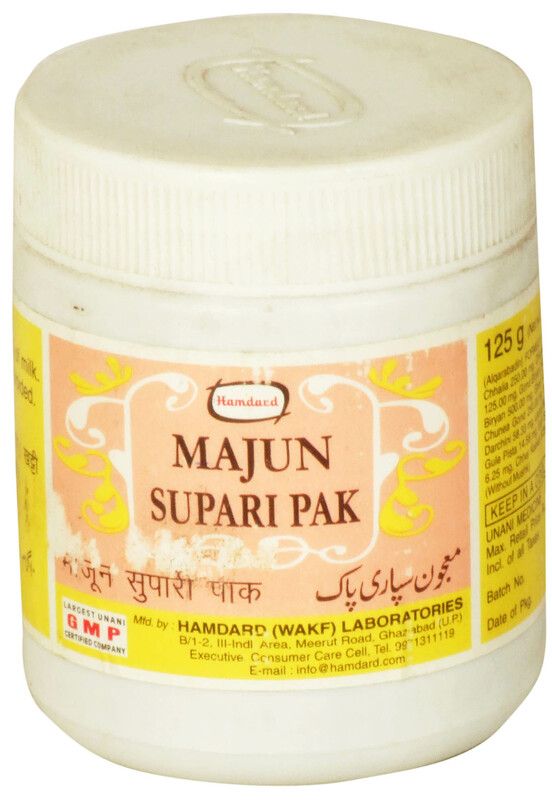 Majun Supari Pak: It helps in increasing the retentive power of the uterus and removes debility after child birth, also increases the time of sexual indu lgence in men. Direction: To be taken with milk in the morning. Formula: Each dose of 10 g contains: Majeeth 125.00 mg, Chhalia 250.00 mg, Chhuara 500.00 mg, Sheere Gao 10.0 gm, aarad Moong 125.00 mg, Gond Biryan 250.00 mg, Nishasta Biryan 250.00 mg, Maghz Badam Biryan 500.00 mg, Ghee 1.00 gm, Qand Safaid 3.00 gm, Gokhru 500.00 mg, Chunea Gond 250.00 mg, Maghz Narjeel 250.00 mg, Salab Misri 58.33 mg, Darchini 58.33 mg, Laung 58.33 mg, Elaichi Khurd 58.33 mg, Sonth 58.33 mg, Gule Pista 14.58 mg, Gule Supari 14.58 mg, Jaiphal 25.00 mg, Chhal Kachnal 6.25 mg, Chhal Keekar 6.25 mg, Chhal Sankhaoli 6.25 mg, Zafran 50.00 mg (without Mushk).